Death, Taxes and Jagr: A hockey blog: What Can We Expect From Paul Stastny on the Blues? What Can We Expect From Paul Stastny on the Blues? Paul Stastny is a 28 year old Canadian center who’s played all 8 of his NHL seasons in Colorado. The 6’0, 205 pound Canadian-born, originally drafted 2nd round, 44th overall by Colorado in the 2005 NHL entry draft, signed a 4 year, $28 million contract with the St. Louis Blues on July 1st, the first day of free agency. This contract came with an Average Annual Value of $7 million. Last season, Stastny scored 25 goals and 35 assists, for a total 60 points, in 71 games played. This does not include the 5 goals and 5 assists, for a total 10 points in 7 games in the playoffs from last season. Stastny’s career highs for goals came in his rookie season, when he scored 28 in 2006-2007. Stastny’s career highs for assists and points came in the 2009-2010 season, when he had 59 assists and 79 points. Before I go further in his stats, I will just say that the “drop-off” in Stastny’s production is not a regression of talent, or a continuation of a “sophomore slump”, it is simply because of Stastny’s game at this point included a more defensive aspect to it. Rebounds, rebounds everywhere. 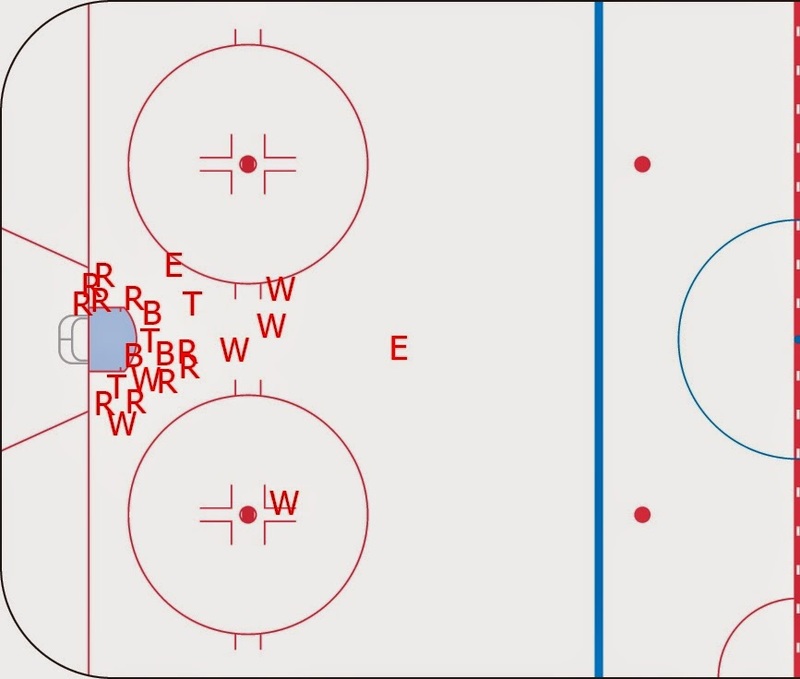 Stastny’s goals from last season pan out to show a center that stays around the goal crease to either screen the goalie, tip-in a shot from the point, or the mash in a rebound at the side or front of the net. This shows that Stastny is able to fight for that position and will fit in with a team with a more physical style of play, like the Blues. One thing that this map is unable to show is just how fast Stastny’s hands are. The ability he has to get the puck off his stick almost as soon as it’s on it is extremely impressive. Let’s take a look at the WOWY for Stastny and his other linemate from the past season, Nathan MacKinnon. When they were on the ice together, Stastny had a Corsi For% of 50.5% and MacKinnon had a Corsi For% of 46.5%. When they were apart, Stastny had a Corsi For% of 52.3% and MacKinnon had a Corsi For% of 47%. There was a mutual deflation of possession stats when both were on the ice. MacKinnon had an overall Corsi For% of 47.9% last season, so it’s going to be interesting to see how MacKinnon’s possession stats pan out next season. Below is a table of the possession stats for the two while on an off the ice last season. So how do these possession stats compare to Stastny’s future linemates? Before I continue, I will just say that while I will address Stastny’s placement in the lineup later on in the write-up, I’m going to assume that his future linemates will be Jaden Schwartz and Vladimir Tarasenko. Last season, Tarasenko played 431:19 minutes on the ice with Patrik Berglund. When they were on the ice together, Tarasenko had a Corsi For% of 58.1% and Berglund had a 57.9% Corsi For%. When apart, Tarasenko had a Corsi For% of 58.2% and Berglund had a Corsi For% of 51.8%. This means that Tarasenko had a 6.1% inflation on Berglund’s possession stats. According to Behindthenet.ca, Tarasenko had a Corsi Relative% of +17.7% last season, which is unbelievably good. This possession inflation by Tarasenko on Berglund is seen again in a larger sample size. In the possession stats from 2012-2014, Tarasenko inflated Berglund’s possession stats by 8.2% (from 49.6% without to 57.8% with). A rough equivalence of Stastny’s adjusted Corsi For% of 55.4% would bring him above the Blues’ team average (53.1%). So Stastny will bring with him a positive effect on the Blues’ possession stats, but what about offensive production? What does Stastny bring to the Blues? Last season saw a good jump in offensive production from Stastny, jumping to 0.998 goals/60min, 1.174 assists/60min, and 2.171points/60 min of even strength ice time in the 2013-2014 season from 0.550 goals/60min, 0.550 assists/60min, and 1.100 points/60min of even strength ice time in the lockout-shortened 2012-2013 season. To make sure this is not a statistical anomaly, I will use statistics from the past 4 seasons, which is 2010-2014. In that time, Stastny had an average of 0.770 goals/60min, 0.943 assists/60min, and 1.713 points/60min of even strength ice time. How does this compare to potential linemates, Jaden Schwartz and Vladimir Tarasenko? In his first 2 NHL seasons, Tarasenko averaged 0.883 goals/60min, 1.324 assists/60min, and 2.207 points/60min of even strength ice time. In his first 3 NHL seasons (yes I am including the 73:54 minutes played from 7 games in 2011-2012 season), Schwartz averaged 0.828 goals/60min, 1.115 assists/60min, and 1.943 points/60min of even strength ice time. What this means is that with the offensive injection from Stastny, and the fact that all 3 are all under 30, and still improving leads me to believe that all 3, if they play on the same line together, will have an increase in offensive production for the next season. As for specific numbers expectations, to determine a baseline number of what can be expected of Stastny for next season, I took the average number of shots taken from the last 5 full NHL seasons (so excluding the lockout-shortened 2012-2013 season), adjusted the number according to age and/or potential linemates, and multiplied the result by his career average shooting percentage (he had a 16.7 shooting percent last year…incredible). The average number of shots taken is 167.6 shots. Without adjustment, multiplying that shot average by his career shooting percent (12.8%) brings an expected result of 21 goals for next season. Seeing as his shot number dropped from 190, in 2011-2012, to 150, from last season, and that Stastny played 8 more games in 2011, I adjusted Stastny’s shot count by adding 8 shots because of the games missed by injury. Why did I adjust it to that? Because over the course of his career, Stastny has averaged about 2 shots / game, and that number would bring his estimated “game count” to 75. This adjusted shot count brings the expected goal count for the upcoming season to 23 goals (originally 22.5, so I rounded up). So where does Stastny fit in on the line projection of the Blues? The statistics I listed above are all assuming he plays on the second with the projected linemates of Tarasenko and Schwartz, but St. Louis’s General Manager, Doug Armstrong, has said "We're not your normally defined first, second, third line. We're more of a group of nine forwards…” and has not ruled out the possibility of Stastny playing on the top line with David Backes on the wing. If the two were to play on the same line, I would assume Stastny would be center because of his face-off percentage from last year, where he was 29th in the league with a 54.1% victory margin vs. Backes’s 51.7%, good enough for 32nd in the league. It may not be a huge advantage, but any step-up that can help the team get a leg-up should certainly be considered. The advantage of having Stastny as 2nd line center will be relieving a good amount of defensive pressure off of top-line center, David Backes. Stastny will add a big amount of defensive forward depth to the team as well. Last season, Stastny came in 16th in the league in Selke voting (the Selke award is given to the best defensive-minded forward), and Backes came in 4th in the voting, so that provides a great 1-2 punch of potential shut-down forwards. I think a big factor in where Stastny finds himself in the line-up will be whether 26-year old prospect, Jori Lehtera, and 30-year old free agent signing, Joakim Lindstrom, find themselves in the line-up. I believe Lehtera will be in the opening night line-up, but Lindstrom will be the major wildcard in the upcoming weeks. St. Louis landed themselves the top free agent of the offseason, and while $7 million a year (roughly) is quite steep, Stastny is still in his prime and is looking to bring a key piece for the Blues as they search for the everlasting immortality that is the Stanley Cup.